Yellow takes me to my happy place. Stenciled inside with yellow and gentle touches of black. The inside color is the gray primer with a coat of polyurethane. I couldn’t get a really good picture of the stenciling inside the cabinet, but this is the stencil I used. Sticky Back Vintage stencil from Caromal Colours. The design of the stencil works great with the decorative wood detail on the drawer. I didn't think I liked YELLOW……….but this is gorgeous. It's soooo very cherry. You've got me wanting to now buy yellow paint and get to my new yellow piece. Im now following you and hope you'll come visit me at PICKINandPAINTIN.blogspot.com. THANKS. Yellow has become my favorite color lately! It's gotten to a point where I try and avoid it so that it's not everywhere. I love the glass doorknobs and the stenciling detail. Great job!! Gorgeous! It looks so happy now! What a fun, happy, BOLD color! It's just so cheerful! Thanks for linking up to the Bloggy Olympics Paint Event! Thanks so much for linking up. feel free to grab a button and share the contest with your readers! Good Luck! I love the color and detail! Beautiful job! Sunny would make my day too! Love the yellow! Love your Sunnier version and the stenciling is gorgeous! Kathy, this is such a sweet and sunny makeover. I really love the color and how the stenciling turned out. Thanks for joining the DIY Talent Parade! That is stunning especially in the yellow. L-O-V-E! Love the bright yellow Kathy!! It looks great now! What a happy cheerful color! Beautiful job! I love the bright color and the unique way you did the stenciling. “Sunny” is such a fun piece! Hello yellow – what a stunning beauty! I would love if you came by my party happening now to link it up! I declare Sunny a huge success:) It is so fun and cheerful, just lovely!I would be super excited if you linked up over at my Anything Goes Link Party going on from 6 MST Friday till midnight Monday. Oh pretty! Yellow makes me happy too! That hutch is great! I'd be doing the happy dance too if that sat at my house! This is beautiful!! I love the bright color and the pretty details inside! Kathy, I love “Sunny”. Wonderful job. She is almost identical to my vintage book cabinet that I transformed but mine is painted a creamy gray. I really love how bold your cabinet is. I shared your makeover on my Facebook page http://www.facebook.com/#!/pages/Hooked-on-Decorating/147974388655098. So Pretty. Love the yellow and the stenciling! That does look happy–and the stenciling looks fantastic! now that is one happy cabinet! lovely! Thanks Stephanie, You need to stop by and see it up close and personal! Thanks Evelyn. I'll hop on over and visit. 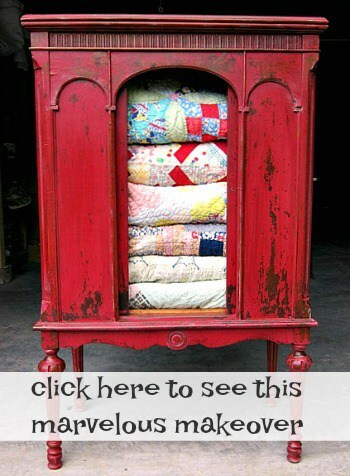 Great save on this awesome piece:) I found you by hopping over from It's So Very Cheri blog hop and am glad I did. 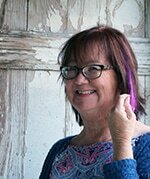 I am now following you on Linky Followers and would so love a visit and maybe a follow back. Looking forward to see your other projects.